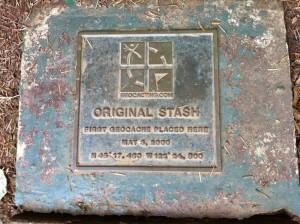 What excites a geocachers more than a First to Find? Having an extra day to find a FTF. Once every 4 years an extra day is added to the month of February. And we all know what that means: an Extra 24 hours to Geocache! Celebrate with two new geocaching souvenirs. The first souvenir can only be earned on February 29 by attending a geocaching event, one happening that morning in Hood River. The other souvenir can be earned all weekend long (February 27-29) by getting outside and finding a geocache. The screenshot shows caches in the Upper Hood River Valley, where our inn, Old Parkdale Inn Bed and Breakfast is located. The star signifies the cache we placed on our property GC4FH6G Parkdale Travel Bug Inn. The innkeepers of the Columbia River Gorge Bed and Breakfast Association are eager to share their favorite spots and events for adventure and exploration in the Hood River Valley, Columbia River Gorge Scenic Area, Mt Adams and Mt Hood.